The world is on fire. Here are five climate change wake-up calls from this summer. For many across the northern hemisphere, the summer of 2018 has exposed the most extreme signs of climate change. Yet despite the series of powerful heatwaves, wildfires and droughts, this is likely only the (melting) tip of the iceberg. After this summer of fire, it’s time to wake up on climate change. On 15 August, British Columbia declared a state of emergency as over 560 wildfires blazed throughout the Canadian province. Over the past five months, wildfires have charred almost one million hectares of British Columbian land. This makes 2018 the second-worst wildfire season in the province’s history – beaten only by 2017. With record-breaking wildfire seasons coming back-to-back, summers of fire are becoming the new norm for British Columbians. 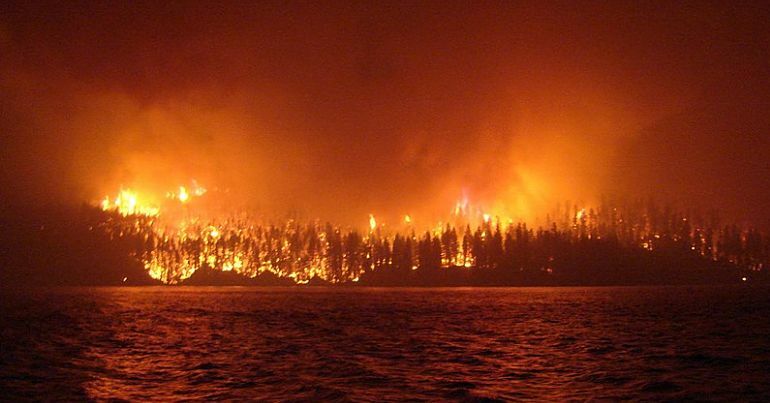 ‘Beautiful British Columbia’, as the province’s car number plates read, is still on fire. Wildfires also raged through a village resort in Greece in July, killing 91 people. On the other side of mainland Canada, a heatwave in Quebec left over 90 people dead in just over a week. Many of those who died were elderly and suffered from chronic illnesses, exposing the mounting issue of heat inequality. The extreme temperatures in Quebec were matched across North America and Europe. In Chino, Los Angeles, temperatures reached close to 120F (48C). Those fortunate enough to own air conditioners caused a power shortage due to overuse. "Heatwave Turns Europe Brown (drought)"
"The image pair below shows the burned landscape of the United Kingdom and northwestern Europe"
Of the 18 warmest years on record, 17 have occurred in the 21st Century. In Sweden, numerous wildfires this summer blazed north of the Arctic circle. Yes, north. During July, Sweden reported three times as many wildfires as is typical for the month. Some of the biggest fires that we’ve seen worldwide now are occurring in the subarctic and now even in the high Arctic areas. While wildfires are not unprecedented in the high Arctic, the number and intensity of recent wildfires is. For the first time on record, the Arctic’s strongest and oldest sea ice broke this summer. Located north of Greenland, the ice cracked because of warm winds and the northern hemisphere’s massive heatwaves. The Arctic is now warming twice as fast as the rest of the planet. The breaking up of “the last ice area”, as scientists used to refer to it, was described by a meteorologist as “scary”. The consequences of climate change are apocalyptic, requiring policymakers to shift to a “wartime footing”, according to climate researcher Will Steffen. As Naomi Klein argues, activists must work towards changing the system rather than tinkering. Minor policy changes create a façade that governments are serious about climate change, while the plundering of the planet’s natural resources continues. By nature, systemic change threatens just about every existing vested interest. This is why the fossil fuel industry has vehemently denied the existence of man-made climate change for so many years. The persecution of climate activists – while unsurprising – represents a major obstacle to tackling climate change. In March, more than 150 people – including many indigenous demonstrators – were arrested after protesting against the building of Canada’s Kinder Morgan pipeline. In Germany, activists occupying the Hambach Forest against destructive coal mining interests are currently facing police repression. ‘Anti-terror’ laws, moreover, are being used against climate activists. For some, the effects of climate change have been visible for some time. But the media has mostly ignored these accounts. Now, the effects of climate change seem unavoidable, even for those shaded by the largest money trees. After the summer of fire, what should be clear is that all of these events are connected. As the planet heats up, heatwaves cause wildfires and ice melts, causing further heatwaves that cause further wildfires and further melting ice… This cycle will soon become exponential and uncontrollable. It’s way past time to wake up on climate change. – Support the work of Climate Reality Project, Fossil Fuel Divestment, and Greenpeace. – See more of The Canary’s Environmental.